The Commission on Presidential Debates (CPD) announced today that Belmont University will now serve as the official alternate site to host a 2016 Presidential or Vice Presidential Debate. The news comes as Wright State University (Dayton, OH) withdrew from its hosting duties late last month, and first alternate Hofstra University (Long Island, NY) was tapped as the new host for the political season’s first presidential debate on Sept. 26. Washington University (St. Louis, MO) and University of Nevada-Las Vegas are currently slated to host the other two presidential debates this fall on Oct. 9 and 19 respectively, while Longwood University (Farmville, VA) will host the vice presidential debate Oct. 4. “Belmont University served very successfully as a presidential debate site in 2008. We are grateful that Belmont has agreed to serve as an alternate site this debate cycle, and our team would look forward to working with them if the need arose,” the Commission said in a statement. In addition to the confidence expressed in the Belmont team to host a debate again, Fisher also pointed out the immense support Belmont is receiving from city and state officials both in the application process and now with the news of the alternate selection. Belmont University was one of 16 sites nationwide under consideration for a presidential or vice presidential debate during this year’s election cycle. Belmont previously hosted the 2008 Town Hall Presidential Debate, moderated by NBC News’ Tom Brokaw, between then candidates Sen. John McCain and Sen. Barack Obama. 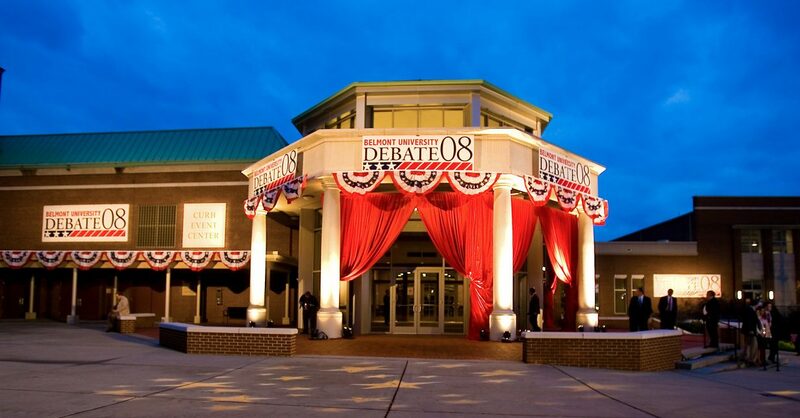 The 2008 Town Hall Presidential Debate was the first and only presidential debate to date to be held in Tennessee.